This screening is postponed to a later date. We will update the website once the new date is determined. Please accept our apologies for any inconvenience this may cause. Directed by Jeremiah Tayao. USA. 2018. 64 min. 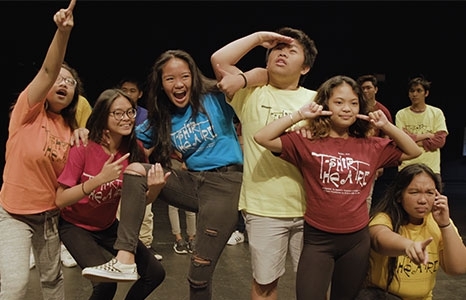 Presented in collaboration with Honolulu Civil Beat*, T-Shirt Theatre presents: Kīpuka is an anti-bullying project that addresses bullying, cyberbullying, and teen suicide prevention. Written and performed by the students (aged 13-18) at T-Shirt Theatre—a performing company based in Farrington High School—the original stories, which are performed live in front of over 1,200 of their peers in a packed Farrington High School auditorium, are drawn from personal life experiences. Kīpuka demonstrates how positive safe spaces and influences like family and community can help counteract the effects of bullying. Founded by George Kon and the late Walt Dulaney in 1985 at Farrington High School, T-Shirt Theatre has long been a kīpuka itself for many generations of students, deep in the heart of Kalihi, Oʻahu. In the story, rehearsal, and performance process, the students are taught to rehearse for life—acquiring important life skills that they will be able to apply to life beyond the stage. Join us for a post-screening discussion with the filmmakers and film participants, moderated by Honolulu Civil Beat’s Suevon Lee. Honolulu Civil Beat reporter, Suevon Lee, covers K-12 education in the state of Hawaiʻi, focused primarily on the public school system. Her reporting includes coverage of the Hawaii Department of Education, the state Board of Education and legislative developments affecting education policy. She has written extensively about teacher recruitment and retention, school bullying, gender discrimination in schools, and the student achievement gap. *By registering for this event, you'll receive a subscription to Civil Beat's free e-newsletter, the Morning Beat. And don't worry, we hate spam too! You can unsubscribe any time by clicking the link at the bottom of each email.